Pop by for an evening of music and check out the latest from BOSS effects and amplifiers! BOSS has been a leader in guitar effects and accessories for 40 years now. Used by countless musicians around the world. Known for its innovative design, sound and durability. A company that is always embracing technology for the benefit of musicians. Beverly Matujal, a singer-songwriter from Sabah who’s collection of heart felt songs will keep you enthralled. Gifted with a voice that is heart warming, she has been actively performing in the scene to promote her debut EP, Echoes. Isaac Ho is a singer-songwriter from Ipoh but currently based in Penang. What’s special about Isaac is his ability to convey messages through his music and his expertise on the BOSS RC-300 LoopStation as his main tool that turns him into a one man band. 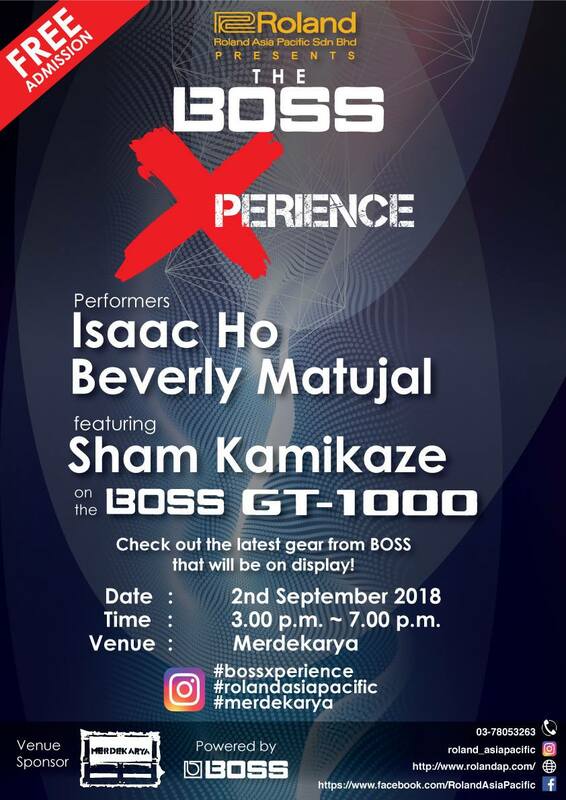 Special guitar clinic on the BOSS GT-1000 effects processor by Sham Kamikaze! Sham is no stranger to the Malaysian music scene. Having made his name the music industry with his band Kamikaze and going on to become one of the most sought after sessionist and musical directors in the industry. There will be a whole bunch of Boss gear available for you to test out at the event. Promos and lucky draw prizes await too! Don’t miss out on this event!